Roast vermicelli with little ghee until it become golden brown. Heat ghee in a wide pan and add cashewnuts,almonds and pistachio. Now,add raisin and fry till it puff up like balloons. Its time to add milk and let it boil and add cardomom powder. Add sugar to the milk and stir it frequently. When milk boils well add roasted vermicelli. Let it cook until vermicelli is soft and tender to eat. Remove from heat when vermicelli is cooked. 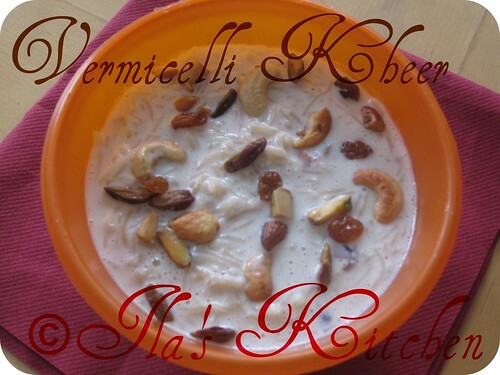 Now Vermicelli Kheer is ready to serve. Vermicelli will absorbs milk while cooking . So add enough milk while cooking or add warm milk while serving payasam. This South Indian Recipe can be served as dessert after lunch or dinner. A very delicious payasam and my fav...tempting one.. This is such a confort food.. Love it anytime.. :) looks perfect. Easy quick dessert, love them. looks delicious. 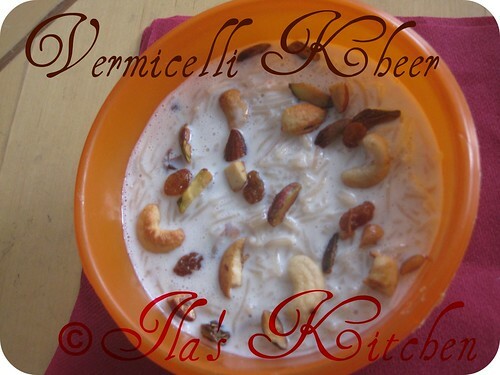 a easy and yummy kheer!....love it with all the nuts! Simply inviting and tempting payasam,yumm! so delicious and inviting payasam !! A classic dessert- glad to see your post! Semiya payasam looks yumm..my all time favorite...when I think of payasam...semiya is what comes to mind first. An all time fav!!! Had made it just last tue when a visited :) Alwayz a hit with guests!! Thanks for your regular support on my blog. Happy to follow you. Love this kheer anytime...simple and delicious!